Great looking 58 plate 320i M Sport. MOT until 2020 and just been serviced with 2 new tyres. Feel free to ask any questions or come for a viewing. Bmw 318 coup Black no rust decent millage 103000 3 owners car is in good condition needs mot but generally will fly through I just can't afford to put it in due to financial circumstances it has great breaks, excellent body work good gearbox and engine half leather interior avarage condition clean and tidy nice allows and good tyres. 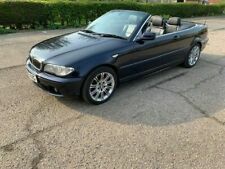 Anyone who mots it has a nice car 100%...couple of extras to give with it tinted lights... Lots of service history..
2005 05 - BMW 330CI CONVERTIBLE. Electric convertible roof. To summarise, A good example of these popular convertible cars. Starts, runs and drives and looks like exceptional value for money! Electric mirrors. MOT; 27th NOVEMBER 2019. PETROL; 2171cc. BMW 320i SPORT TOURING ESTATE. YEAR; 2004. NICE CONDITION INSIDE AND OUT BUT ONE CREASE IN THE FRONT NEARSIDE WING ARCH, SEE PICTURE 5. ELECTRIC WINDOWS / MIRRORS. GCS Cars - Visit us for a test drive - Call us on 441832771008 or click here to find out more. BEST ONE TRADERS LIMITED - Call us on 441708206413 or click here to find out more. BMW 325 2.5 2007MY i SE A GREAT COMBO COUPE! SKYMAN MOTORS LTD - Call us on 441384885498 or click here to find out more. Bmw 3 series 2006 318i manual 4 door petrol silver. Read description! Bmw 3 series 2006 ! !warranty included!! Well looked after bmw. Looks baby blue but actually a pearl green.